Bad Apple!! Hakurei Reimu (Doll Profile #6) – How Do You Figure? Looking back, Reimu occupies a really strange place in my doll family. I was never super attached to her character, knew almost nothing about Touhou, and my only real exposure was the Bad Apple!! music video. When Volks announced a collaboration to turn Reimu and Marisa into their debut models for the new DDS body, I was only mildly interested. To be honest, I was probably more interested in the new body than the characters themselves. I’d even had the opportunity to see them during my 2010 trip to Japan. They were in a display case at the Ikebukuro Volks Store (the store isn’t there anymore), but weren’t available for sale yet. The weirdest part about the new girls was that they were region locked and Japanese exclusive. There wasn’t an international release or plans to, likely due to licensing restrictions for the Touhou property. With that added in, I had very little interest in trying to track them down. Which brings us to late 2011, when I was sort of itching for something new. I was trolling Mandarake’s web store and stumbled upon the listings for Reimu. There weren’t very many and one particular listing jumped out. She was a fair price (for the time), in decent condition, and in stock. I’d really wanted to play with the DDS body for some time, so I went ahead and made the purchase. A short time later, Reimu landed on my doorstep. 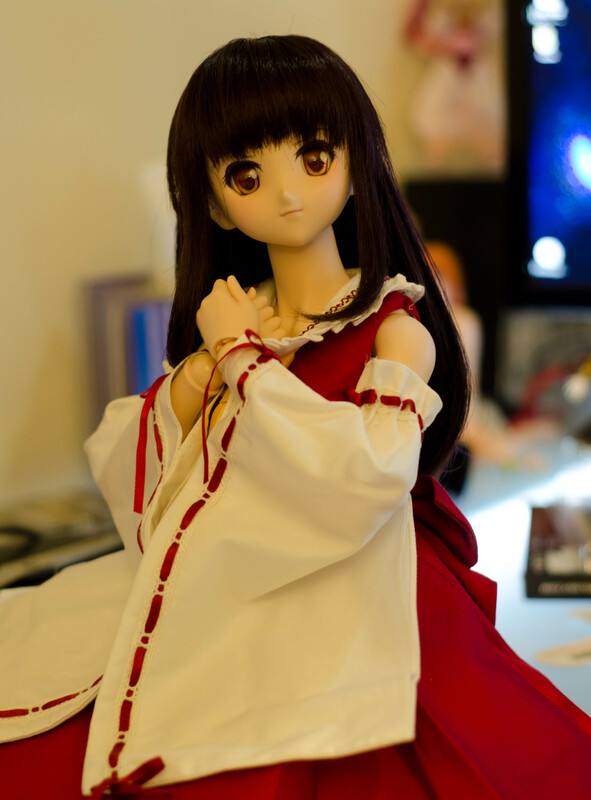 Even though I never really bonded with Reimu’s character, I really do like her as a doll. The new DDS body was very interesting and I really liked having one! It was the first Volks vinyl body to feature double jointed elbows, meaning much nicer posing with hands and arms. The DD2 bodies could only bend to about 80 degrees, meaning you could not touch the hand to the face without some pretty unnatural positioning. In contrast, the DDS elbow allowed for the arm to almost double over on itself! Fortunately, Volks carried this design decision forward for the new DD3 bodies! Unfortunately, the DDS body suffered from a pretty major flaw with the shoulder joints. For some reason, the engineers did not appropriately reinforce the sleeve where the arm peg attached to the torso (a cost saving measure, perhaps?) Due to manufacturing tolerances, some arm pegs were slightly fatter than others, putting a lot of strain on the thinner holes in the torso. This resulted in a lot of early dolls to develop cracks in the plastic and some broke all together. There weren’t a lot of great ways to fix this, unfortunately. A couple companies released metal reinforcement bits to clamp over the plastic to hold things in place, while other enterprising owners fashioned a reinforcement part using zip ties. Volks did later correct the issue, but early adopters were left with the makeshift fixes or buying new parts. Looking back on the last several years with Reimu in my family, I realized that I did the least amount with her. She gets the occasional outfit change, but rarely gets much spotlight on her for photoshoots. When I went to put this post together, I realized that I had only taken her to one or two meets and done two or three actual photo shoots with her! It’s unfortunate because she has such a cute (if not generic) sculpt, I really should do more with her in the future!